No need to worry about the hot water running out or others using it all – it’s literally an endless supply of thermal spring water pumping up from underground in the middle of our red-dirt country. Douglas (or Tjuwaliyn) Hot Springs Nature Park is a must-do stop-off, even if it’s only for a quick dip, if you’re wondering around between Darwin and Katherine in our Northern Territory. Everyone visits Kakadu and Litchfield NP’s while up in the Territory, most visit the overcrowded Mataranka Springs (more hot springs), but many miss out on or don’t know about Douglas Hot Springs, which lacks the big crowds of the more popular spots. Sure Douglas lacks the deep crystal clear swimming holes of Mataranka, but at least it’s all natural in its setting. There are camp grounds here, but don’t expect much in the way of lush green grass to pitch a tent on. Rather it is a large flat and level (potentially dusty depending on time of year) area perfect for camper trailers and caravans. Road conditions (while varying depending on weather and time of year) are generally good via the last stretch of graded gravel road and you’d reasonably expect an easy trip even with camper trailers or caravans in tow. We managed to be the only people there during our visit; perfect for relaxing in the warm water and teaching our little fella the fine art of swimming without the shivers. As you’re heading south from Darwin, point you bull bar onto road ‘23’ the Old Stuart Highway (or Dorat Road), the scenic route from Adelaide River which winds it’s way back onto the main track – Stuart Highway – just south of Hayes Creek. Be sure to take the turn heading (roughly) South / South / West towards Douglas Daly Park onto Oolloo Road. You’ll then hook a left (back East-ish) into Hot Springs Road just before you get into Douglas Daly and find the Douglas Hot Springs Camping Area on your right a few kays down the gravel track. Missing this last turn into the camp area will see you potentially travel another 17 kays into Butterfly Gorge Nature Park, but there is a locked gate on route during the wet season. Once you’re into the camping area, set up your gear or park in the day use area, then slip into something more comfortable for a dip, but beware the water can get dangerously hot in some parts of this river. Do keep an eye on kids that they don’t go headlong into the near-boiling water or become stuck in the quicksand. Sounds dangerous dunnit’; well it can be and there are plenty of signs erected to warn of the dangers so do take your time to read them. Also, do keep out of the sacred sites, of which they are an important place for Wagiman women's business ceremonies. Keep in mind that on the odd occasion the whole area may be closed due to ceremonies taking place or even if water quality drops to unhealthy levels. The Park is owned by the Wagiman people who jointly manage it with the Parks and Wildlife Commission of the Northern Territory. For those intent on a little hiking, lace your boots up and wonder along the creek line around the hot springs or perhaps along the Douglas River. You’ll potentially spot plenty of bird life during the day as well as furry creatures such as bandicoots, quolls and flying foxes at night. Crocs are reputedly non-existent down here. With the river and hot springs creating a small oasis in what is an extremely harsh environment; take the time to relax in the warm waters amongst the dry woodlands. Savor the remoteness of it all and remember if the waters too hot, shuffle downstream a little until you get just the right temperature flowing past your weary body. Don’t be in a rush, there’s plenty to go ‘round. About 200km south of Darwin and 130km north of Katherine, just south of Hayes Creek. Once on road ‘23’ the Old Stuart Highway (or Dorat Road), head towards Douglas Daly Park on Oolloo Road, then into Hot Springs Road to get to the camping area. There is a large camping area with pit toilets, barbecues, firewood, picnic tables and water. Power is not available. Camping fees can be deposited in the honesty box provided or paid to the Campground Manager. Best time to visit is in the dry season (May - September) as heavy rains during the wet season (October - April) may cause road closures. Best shopping is either in Darwin or Katherine, although fuel is available much closer at Adelaide River to the north and Pine Creek to the south. Be aware that some parts of the river are very hot, observe park safety signs. Carry and drink plenty of water and wear a shady hat, sunscreen and insect repellent. Wear suitable clothing and footwear both in the water and out. Avoid strenuous activity during the heat of the day. 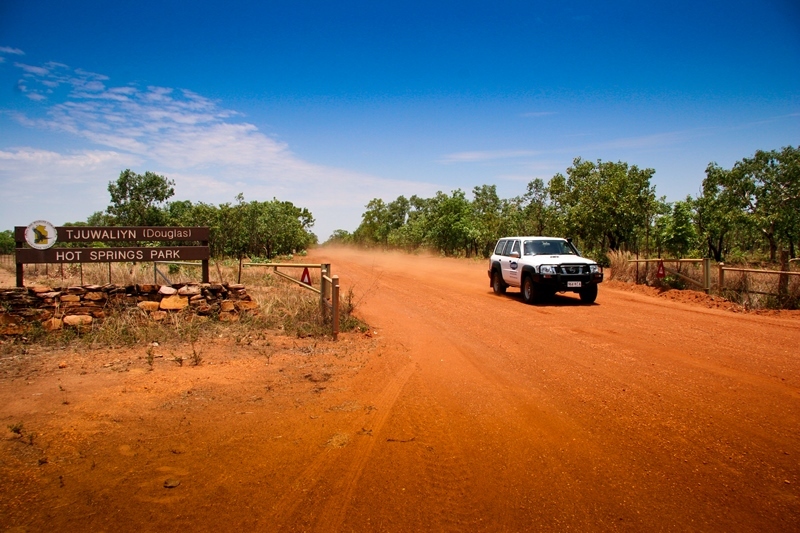 You’re in a remote area, so ensure your vehicle is well maintained and equipped. Men are not permitted near the sacred site. Glass is not permitted in or near the river; people’s feet are at risk. Keep to designated roads and tracks. All cultural items and wildlife are protected. Nets, traps and firearms are not permitted. Light fires only in fireplaces provided. Soaps and detergent are not permitted in the river bed. Check that your vehicle is not transporting pests like weeds and Cane Toads.